As the demand for high-precision biotech filters continues to rise, so does the need to drive down the cost of end products. While such filters have especially rigorous coating requirements, they are often overspecified for the intended application, adding unnecessary complexity to the optical design and manufacturing process and increasing the final product cost. By determining the application’s actual needs and exploring alternatives, developers can meet high-performance demands at a competitive price. Biotech is a market on the rise, with attendant increases in cutting-edge research techniques and the demand for biomedical instruments that incorporate internal optical systems and/or components. This growth in demand, in turn, propels competition among optical manufacturers and sets high customer expectations in terms of instrument cost and performance. Among the most sought-after optical elements fueling this competition are biomedical filters. The industry uses many filter types in biomedical applications such as fluorescence microscopy, flow cytometry and Raman spectroscopy. Fluorescence microscopy, for instance, uses high-precision bandpass filters in conjunction with a 45° dichroic to provide discrete excitation/emission wavelength separation while maximizing the signal-to-noise ratio in the fluorescence image. A Raman spectroscopy system, on the other hand, may employ a laser-line notch filter to remove spurious background from the probe laser, with a long-pass ultrasharp edge filter to deeply attenuate Rayleigh scattering. Given the accuracy required in such biotech applications, the filters used must perform to very demanding specifications. It’s not unusual for a fluorescence filter to require blocking OD >6, transmission in the passband >90% and edge steepness (defined here as wavelength separation between 50% transmission and OD >4) <0.5%. Manufacturing a filter to such performance specifications requires a viable design and a high-quality coating process. A complex coating will expose even slight manufacturing flaws, so developers must consider several key design aspects prior to filter fabrication. One key aspect of biomedical filters is their inherently thick coatings, resulting directly from the tight cut-on/cut-off tolerances and broadband coverage they are required to achieve. For instance, the coating thickness on a bandpass filter in the visible could range from 8 to 16 μm per face, depending on the blocking’s level and extent. Another key aspect is coating density. A porous film will exhibit spectral shift when exposed to varying thermal conditions or changes in humidity (i.e., when exiting a vacuum pressure chamber and interacting with the atmosphere). Given that biomedical filters need center wavelength and full width half maximum tolerances on the scale of ±2 nm, it doesn’t take much spectral shifting to result in a nonconforming filter. The coating thus must be dense enough that it incurs minimal to zero spectral shift over time. Not every deposition process is well suited to producing coatings that meet such demanding spectral requirements. The technology must have the ability to control thickness deposition accurately to produce a robust coating with minimal shift. Few coating technologies offer the needed capabilities while maintaining a cost-effective end price. Edmund Optics has found that only advanced plasma reactive sputtering technology can efficiently produce these difficult-to-manufacture coating designs. Fluorescence bandpass filters from Edmund Optics. When designing and specifying components for an optical system, cost is always a critical factor. Biomedical filters cost more than their lower-precision equivalents, because achieving high performance entails additional design and manufacturing processes. Performance differences can even increment cost across a similar biomedical family, such as a bandpass filter with OD4 attenuation versus one with OD6. Table 1 shows a direct comparison of production time associated with two bandpass filters manufactured by Edmund Optics. The only difference in the filters is that one is higher performance in terms of blocking depth and passband transmission and thus has a thicker coating, requiring more machine time to fabricate. To save money, developers should perform a system analysis to determine the blocking they actually need. Of course, there are situations where the system absolutely requires extensive blocking to operate effectively, but too frequently developers overspecify attenuation because they don’t associate eeper/broader blocking with an incremental fixed cost. Figure 1 shows performance for the two bandpass designs in the example. If such performance differences can be tolerated, it’s worth sacrificing performance to save cost. Performance for (a) high-transmission OD6 bandpass filter vs. (b) hard-coated bandpass interference filter. It’s critical to use a substrate appropriate to the application wavelength. For high transmission in the ultraviolet, choose fused silica or an equivalent. Conversely, for transmission in the infrared, consider a material such as germanium or zinc sulfide. It’s also important to know where the glass is transmitting and where extreme-absorption bands occur. Transmission range is highly dependent on glass index because index determines percentage loss due to Fresnel reflections. Most biomedical filters need a high and flat percent transmission for the intended application range. To reduce cost and material lead time, though, avoid obscure and specialty glasses when a BK7 or Borofloat will do the trick. High-grade fused silica, for instance, costs on average 10 times more than a glass like Borofloat33. Similarly, colored glasses, which can help provide deep and/or extended blocking, are often expensive and must be special-ordered. Another selection factor for biomedical filters used in fluorescence applications is the substrate’s autofluorescence. 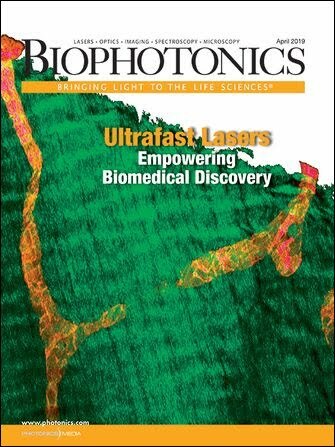 Substrate autofluorescence that is unaccounted for at the application wavelength could debilitate the system. Work-arounds exist, such as adding blocking after the glass to attenuate fluorescence, but the best approach is to minimize autofluorescence through careful substrate selection. Data shows that most fused silica and CaF2 glasses are good choices, with select BK7 materials close behind. The thick coatings common to biomedical filters amplify any surface imperfections in the glass. Hence, demanding surface quality specifications are often difficult to meet and have a significant effect on post-coat yields. Meeting stringent quality requirements often makes it necessary to use higher grade substrates, which can substantially increase costs. Customers are often put off by minor blemishes, but it’s important to realize that cosmetic imperfections do not necessarily hinder optical performance. A more expensive substrate might produce a more visually appealing part, but the same coating on a substrate with minor cosmetic flaws may offer the same optical performance for less. If cost reduction is a primary motivating factor, consider looser scratch-dig requirements. Unless the optical system in question has a unique configuration, use standard off-the-shelf component sizes whenever possible. Most optics vendors stock standard sizes, whereas fabricating a custom size entails a longer lead time and higher rate per piece. It’s advisable to research size availability early in the design phase to avoid having to order all custom optics to implement into your system. Economies of scale that exist from a manufacturing, sourcing, coating tooling and test setup perspective will most likely make a 25-mm standard size significantly more affordable than a 24.7-mm custom size. Biomedical filters’ thicker, higher-stress coatings can compromise substrate surface flatness, so specify only the flatness really needed. Requiring quarter-wave accuracy can introduce additional manufacturing steps and might require the starting substrate to be eighth-wave or better to achieve quarter-wave after coating. A tight surface-accuracy specification also requires surface measurement after coating and often means adding SiO2 on the alternate face to compensate for warping. Understanding the critical specifications in your design will help you immediately recognize and prepare for these cost drivers. In some cases, a tight specification may be imperative to the success of the project. In others, tight specifications serve only to deplete the budget unnecessarily because a looser specification could have been used to achieve the same results. Knowing which is which is essential to meeting both cost and performance goals. With such vendor support, developers are well positioned to take maximum advantage of cost reduction opportunities in biomedical instrument design. By avoiding overspecification, developers can contain costs without affecting system performance. Amber Czajkowski is a thin-films engineer at Edmund Optics in Pennsburg, Pa.; e-mail: aczajkowski@edmundoptics.com. Accuri Cytometers Inc. had a seminal product vision: to develop an affordable, easy-to-use personal flow cytometer system by decreasing system complexity to lower costs, and increasing stability to reduce service requirements, while remaining competitive by not compromising on overall performance. Signal-to-noise ratio is an example of a system-level requirement that Accuri needed to consider. To maximize optical signal strength, Accuri specified laser cleanup filters, detector filters and lenses for maximum transmission at the wavelengths of interest. High stop band rejection through carefully designed filter curves helped minimize noise, and antireflection coatings on all lenses to eliminate spurious light further reduced it. The use of substrates such as fused silica in the optical components provided a critical minimization of autofluorescence. Edmund Optics worked closely with Accuri Cytometers to develop the most efficient design for its personal flow cytometer system. Photo courtesy of Accuri Cytometers Inc. The coating team at Edmund Optics collaborated with Accuri through several design iterations to optimize cost and performance of coatings. For the laser cleanup filter for light-starving applications such as flow cytometry, for instance, typical requirements are transmission >98% and blocking values of OD6. Edmund Optics designed the coating and optimized the filter specification for manufacturability, providing Accuri the transmission and blocking curves for review. The coating design then went through a series of tweaks to further optimize performance vs. cost, with Accuri communicating the performance requirements and Edmund Optics providing suggestions on coating cost drivers. The result was a filter that provided acceptable performance at a competitive cost. A method of measuring the characteristics of microscopic particles, usually cells, as they flow in a fluid stream through a beam of light. Particles may be stained with fluorescent dye and the fluorescence detected via laser illumination. Observation of samples using excitation produced fluorescence. A sample is placed within the excitation laser and the plane of observation is scanned. Emitted photons from the sample are filtered by a long pass dichroic optic and are detected and recorded for digital image reproduction. Full width half maximum (FWHM) is a measure of the extent of a function. Given by the difference between the two extreme values of the independent variable at which the dependent variable is equal to half of its maximum value. The term duration is preferred over width when the independent variable is time. Commonly applied to the duration of pulse waveforms, the spectral extent of emission or absorption lines, and the angular or spatial extent of radiation patterns. Glass consisting of almost pure silicon dioxide (SiO2). Also called vitreous silica. Frequently used in optical fibers and windows. A crystalline semiconductor material that transmits in the infrared. Materials that, by virtue of their optical characteristics (i.e. refractive index, dispersion, etc. ), are used in optical elements. See crystal; glass; plastic lens. Scattering by particles very small compared with the wavelength of the radiation being considered. A feature of Rayleigh scattering is that the scattered flux is inversely proportional to the fourth power of the wavelength. Thus in the visible region, blue light is scattered more strongly by the molecules of the air than longer wavelengths, accounting for the blue color of the sky. A polycrystalline material that transmits in the infrared; it is used as a phosphor in x-ray and television screens.